To Some Runners, Zombies Are A Killer Motivator : The Two-Way Some people run for charity; some run for their health. And some run to escape the ravenous brain-eating zombies who chase them. The popularity of Run for Your Lives, a "zombie-infested 5K obstacle race," has surprised even its organizers. Some people run for charity; some run for their health. And some run because it's the only way to escape the ravenous brain-eating zombies who chase them. No, that's not a movie plot. It's essentially the pitch for Run for Your Lives, a "zombie-infested 5K obstacle race" whose popularity has surprised even its organizers. After they came up with the zombie idea, race co-founder Derrick Smith tells Ryan O'Hanlon of Outside magazine, he and his friend Ryan Hogan gathered a staff of seven to help them organize the first-ever Run for Your Lives event near Baltimore, Md., last October. "Then 12,000 people showed up," O'Hanlon writes. A runner tries to escape with his life as zombies pursue him during the Run for Your Lives race. 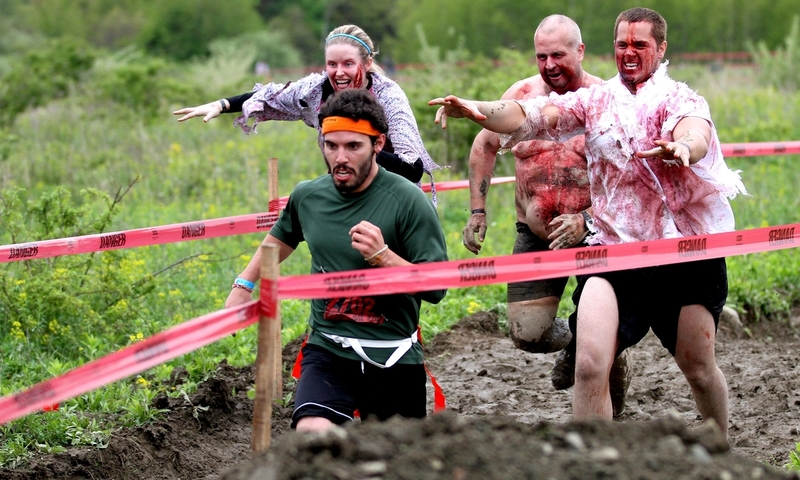 The 5K course is littered with obstacles — and the undead. The draw seems to be what Smith calls "extreme distraction" — an event that's so outside the norm that it can't help but be fun. Less than a year later, Run for Your Lives has spread (yes, like a virus), with 12 races planned this year in cities from Austin to Toronto. And people are signing up by the thousands. Smith says they should finish 2012 with 75,000-85,000 participants. During the race, waves of runners hit the course wearing "health flags" on their waists — one on each side, and one in back. Along the way, they must navigate obstacles, harried by slow-footed but determined zombies. The race allows participants to sign up for either role. And those who choose "zombie" often take their roles — and their makeup — very seriously. The Race FAQ answers the question "Can I bring weapons to protect myself against the undead?" with the answer, "No. You only weapons will be your abilities to run away and make quick decisions. Train well." Some runners might choose to train by using a smartphone app with the uncomplicated title, Zombies, RUN! The app gives runners a game-like atmosphere in which they can tie their real-world runs with the tasks you might need to achieve in order to survive a zombie apocalypse — things like finding cans of food, or medical supplies. The idea for the game came to writer Naomi Alderman, she says, while she sat in a running class. There, she realized that one thing that would inspire her would be the need "to be able to out run the zombie horde," as Alderman said on All Things Considered earlier this year. That kind of practical/fantastical motivation drives participants to pay $77 and up to take part in the Run for Your Lives race. There's just one problem, Smith tells O'Hanlon: Everybody wants to be a zombie. "Zombies are really popular," he says. "Maybe its supply and demand, but we don't sell as many runner tickets as we do zombies. In the first two months, we sold out all of our zombie tickets for the whole year." The zombie cognoscenti might spot a potential loophole here — say you allow yourself to be overcome by the lifeless horde; wouldn't you then be transformed into one of the undead? "If all of your flags have been taken while you are running the course, you are NOT automatically transformed into a zombie and you may NOT take another runner's flags, chase other runners, or pick up flags off of the ground," according to the race rules. The race draws a wide range of athletes, Smith tells Outside. "We're getting a lot of people saying 'Hey, this is the first time I've had a reason to run,'" he says. "I think we've found a niche of people who usually had hobbies that were more indoors—like video games, like comic books, that sort of thing—but the love of zombies can get them off the couch and do something maybe a little healthier." The group's website shows that some real thought has gone into its partnerships. There's Subaru — "the official escape vehicle of the zombie apocalypse" — and of course, the American Red Cross.